Runaway Bay Area housing prices — fueled by strong employment and scarce inventory — have started stalling in San Mateo and Santa Clara counties, hinting that even well-salaried professionals have had enough. Resale home prices dropped year-over-year in February in Santa Clara County by 16 percent and in San Mateo County by nearly 6 percent, according to a report released Thursday by real estate data firm CoreLogic. A typical home in the two counties still sells for more than $1 million, making the Peninsula communities among the most expensive in the country. Overall median home prices for the nine-county region surged by 4.6 percent to $790,000, led by strong gains in the East Bay. CoreLogic analyst Andrew LePage said high mortgage rates and a bumpy stock market late last year slowed home sales. He added that even some high-income earners might have been driven away by higher prices in Silicon Valley. Home sales over $2 million in Santa Clara County dropped nearly 30 percent in the last two months, compared with the same period last year. But he said that a recent drop in rates and more homes for sale could lead to a rebound. Local real estate agents report strong demand but also some signs of slowing, with high-end properties sitting longer on the market. 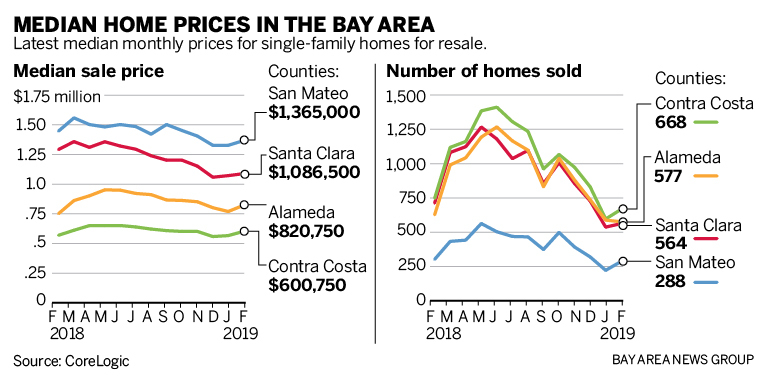 Year-over-year prices climbed in some areas last month, according to CoreLogic data from Bay Area counties: Median sale prices for resale homes grew 9.4 percent to $820,750 in Alameda, rose 5.5 percent to $600,750 in Contra Costa, and 6.7 percent to $1.23 million in Marin. But the super-heated prices in tech-heavy counties dropped: Santa Clara home prices fell from $1.29 million last February to $1.09 million this year, while San Mateo dropped from $1.45 million to $1.37 million, and San Francisco remained flat at $1.45 million. Santa Clara County prices also dropped double digits, year-over-year, in December. Alan Barbic, president of the Silicon Valley Association of Realtors, said agents on the Peninsula are working harder to sell high-end properties. “Without a doubt,” he said, some professionals have been priced out of the market. But the valley market is getting back to a more historic balance, he said. “It’s been years since we’ve had to talk price reductions with our clients,” Barbic said. Transactions fell 12 percent from the previous year and were at the lowest mark for February sales since 2008. The record streak of rising Bay Area home prices started in April 2012, when the median sale price in the nine county region was $425,000, according to CoreLogic. Over the next seven years, median sale prices have more than doubled, hitting a peak of $935,000 last May. Interest rates have remained at historically low rates and have dropped in recent months. The average 30-year fixed mortgage is at 4.06 percent, a drop from a recent high of 4.9 percent in November, according to Freddie Mac. Bay Area real estate agents say the market has remained strong in certain areas — especially for starter homes listed at or below the region’s median sale price. The more-affordable East Bay has seen prices and sales grow. Matt Rubenstein, an agent with Compass Real Estate in Contra Costa County, said homes listing between $800,000 and $1 million were moving quickly and with multiple offers. Properties near public transit remain attractive for East Bay commuters heading into San Francisco. One recent single family home listing in Walnut Creek drew several competitive offers, he said, and likely will close over the $1.1 million asking price. “I don’t see it slowing down,” Rubenstein said. Buyers with more cash are picking and choosing through limited inventory and waiting for better deals, agents said. San Jose agent Gustavo Gonzalez, president of the Santa Clara Association of Realtors, said the market remains robust — as long as sellers price their homes fairly. Buyers have been hesitant to jump into deals when sellers ask for top-of-the-neighborhood prices, he said. Gonzalez sees plenty of demand in the East San Jose foothills. He has a half-dozen buyers looking for homes between $750,000 and $1.6 million, he said. Several are getting help from family members to make the hefty down payments. “It’s really hard without the support of people with deeper pockets,” he said. Fremont agent Nancie Allen, president of Bay East Association of Realtors, said the market has cooled, but sellers still can expect healthy appreciation on their homes. “Overall, prices are really good,” she said.